In 1963, Wayne Owens founded Wayne Printing out of his home. As the business grew and prospered, it moved to a larger facility in Mount Hawley Industrial Park. Owens sold the company to Heights Finance Corporation in 1974. 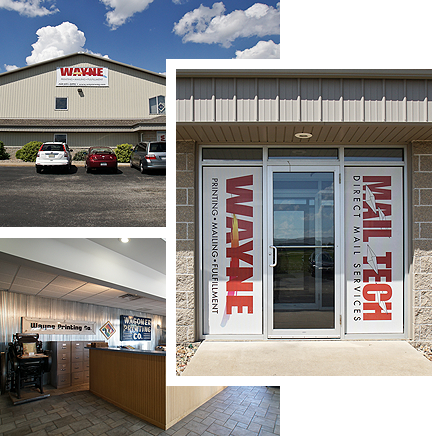 The company continued to grow and, in 1983, Wayne Printing purchased Wagoner Printing Company in Galesburg, Illinois, which allowed entry into the four-color process commercial printing market. In 1991, Wayne Printing returned to being a family-owned business when Ken Hoerr, Jack Kinney, and Scott Hoerr purchased the company. The two company locations moved into a new 37,000 square foot facility located in Edwards, Illinois in 2001. The new location merged the equipment and staff from both locations under one roof. The company also added new state-of-the-art printing equipment including computer-to-plate technology, a Heidelberg QMDI four-color press, and a five-color 28×40 Heidelberg press. The presses allowed the company to offer large format color printing and direct image printing services. Wayne Printing then purchased Mail Tech Enterprises, a direct mail and fulfillment business, in 2001. The addition of the direct mail company provides Wayne Printing with additional marketing tools that allow for a “one stop shop” that many clients demand today. At Wayne Printing, we take pride in our work. The passion we have enables us to take ownership of our customers’ projects. There is no greater satisfaction than delivering a quality product that helps our clients achieve their objective. Changes occur daily in our industry and our staff stays in touch with the ever-changing requirements to make your project a success. Whether it is postal regulations, paper stock, finishing methods or a whole host of details, you can count on Wayne Printing to be your valued and trusted source from printing to mailing.